Compelled By Love: Ed Stetzer and Philip Nation on TSK today. 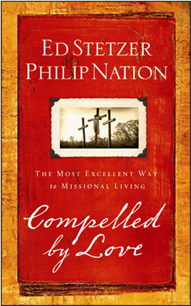 Today I have special guests Ed Stetzer and Philip Nation on the blog to talk about their book Compelled By Love: The Most Excellent Way to Missional Living. The website for the book is worth a visit. TSK: Ed and Philip, thanks for the book. I think it’s fantastic that you point to love as motivation for mission. I hope the book does really well. I have a few of Ed’s books on my shelf – Breaking the Missional Code and Perimeters of Light: Biblical Boundaries for the Emerging Church. They are both very accessible books, accessible to a wide audience. I guess Compelled by Love follows in that style. Your conclusion reminds me of Milfred Minatrea’s excellent book, Shaped by God’s Heart: The Passion and Practices of Missional Churches. He also worked for the Southern Baptists, as did we all. Do you think the challenge of love is a unique contribution by the Southern Baptists to the global missional conversation? ED and PHILIP: I don’t know that our emphasis is unique. But I do think that many in our tribe have a mission impulse because of their love for the lost. And, the emphasis on a love for the lost makes it easy to connect to a missional impulse. Ultimately, it is hard to get beyond the teachings of Jesus and the totality of scripture without seeing love as the motivation for mission. Now I don’t see it as the only motivation for mission. The increasing emphasis on the glory of God is a healthy thing. But, the purpose of our book is to emphasize love as central to the missional impulse. A phrase like “compelled by love” – not ours, but borrowed from 2 Corinthians 5 – easily encapsulates this impulse. The whole point of the 2 Corinthians 5 passage seems to be that because of what Jesus has done on the cross, we are going to Be-Do-Live differently. And the underlying reason for that is love. ED and PHILIP: Andrew, we would say that any strategy which is God-inspired and God-blessed must be developed in, and lived out with, a spirit of love. But I would caution that there are churches across the world filled with loving people who have not gotten their love out on a mission. To correct this, love must be defined biblically. In Christ, we see that while we were sinners, enemies, and outside the camp – he died for us. So we carry that to the teaching that we should love him because he first loved us. Then – one more step – we must imitate the love of Christ as he wept over Jerusalem because they did not understand the peace he wished to bring and over shepherd-less sheep to whom he extended his compassion. ANDREW: What do you think is the greatest barrier for people in loving their neighbors? It is the natural inclination of men and women to avoid disequilibrium in their lives. They want to stasis… to get set, be in their own community, in their own tribe of like-minded people. They wish to be unbothered and unmolested by those who are different around them. Thus, people spend their lives building a construct of their own making which meets their own needs among their own people for their own purposes. In other words, they build a kingdom of self. Jesus comes in and not only demands and breaks down our kingdom but calls us to build his. So, his agenda must be supreme– not ours. His concern for the outsider is priority over our concern to create comfort and equilibrium in our own lives. The agenda of our lives must be for His glory, not our preferences. We are to live for his kingdom– and it is a kingdom of love. God calls Himself love. 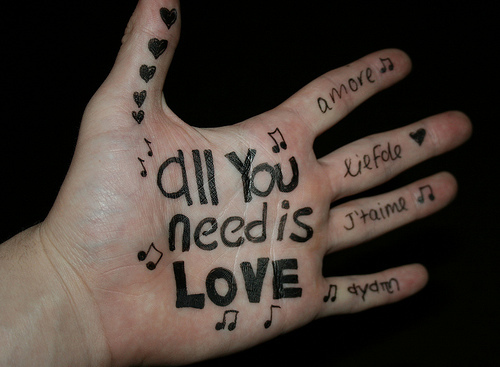 He is love. So, if we call him savior, we must live lives shaped by love. Without a doubt, this becomes difficult because the entire fallen creation teaches us to make every experience about our kingdom of self. Jesus instead tells us to make it about his agenda. In Mark 12:29-30, Jesus declares the Shema and pronounces what we call the Great Commandment. Because of the utter greatness of God, we are to love him supremely and love others richly. I’m always struck that the Bible always tells us to love others. But there is a reason. Most of instructions in Bible are given to people doing the opposite of what it demands. In other words, if the Bible says “Quit sleeping around,” it means people are sleeping around. If the Bible says “Love one another as I loved you,” it tells us people are not as loving as they should be. That is why the gospel of Kingdom is so remarkable. It is not just a new leaf, it is a new way of life. ANDREW: Ed and Philip, thanks a lot for turning up and I hope your book does well. You may want to check these comments later on in case anyone has some comments or questions. Peace! Related: What I mean when I say “emerging-missional church” and what I thought of Ed Stetzer’s Perimeters of Light. Next Post (n)	Mankini: Its NOT MINE! Honest!